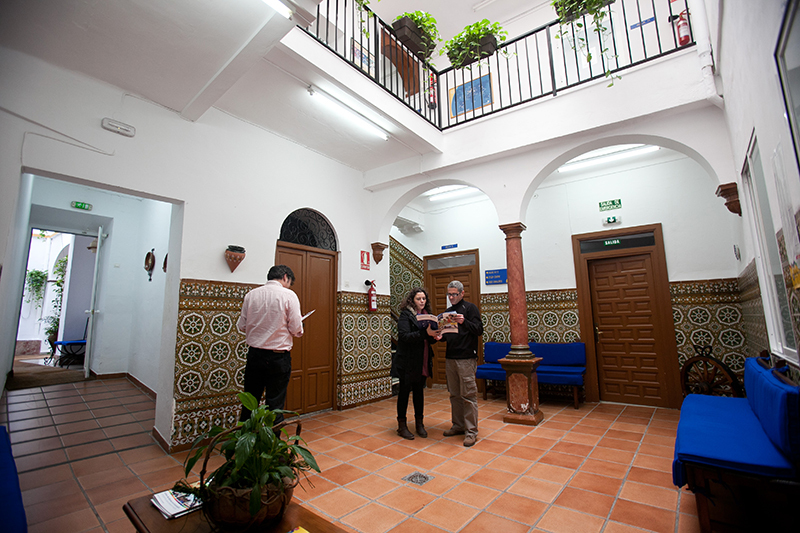 Learn Spanish in Cordoba at our partner Spanish school, the Academia Hispánica. Located on the edge of the historic centre of the city, and built in the traditional Andalusian style, Academia Hispanica is situated in a spacious two-floored building with a beautiful courtyard and terrace. The intensive Spanish course in Cordoba is the most popular course among students as it allows them to combine their Spanish language lessons with enough time for leisure. It is also considered to be the programme that sees the most improvement among students. The intensive course is a general Spanish course consisting of 20 lessons per week, with each lesson lasting for 50 minutes. The intensive Spanish course caters for all language levels, with a maximum number of 6 students per class and is possible to do this course for one week or more. Surcharge for private bathroom: € 47 per person per week. In 2019 the school is closed on the following holidays: 01/01/2019 - 07/01/2019, 28/02/2019, 18/04/2019, 19/04/2019, 01/05/2019, 31/05/2019, 15/08/2019, 09/09/2019, 24/10/2019, 01/11/2019, 06/12/2019, 09/12/2019, and from 23/12/2019 - 06/01/2020. Lessons missed due to bank holidays will not be rescheduled or refunded. The Combined course in Cordoba is specially designed for those participants who would like to study in a group, yet at the same time have some private lessons for their professional or personal needs. You can choose to add 5 or 10 private lessons to your 20 group lessons per week. With the DELE (Diploma de Español como Lengua Extranjera) course you can prepare yourself for the DELE exam. The course consists of 10 lessons exam preparation per week and has a duration of 4 weeks. The course needs a minimum number of 2 students per class. If you would like to take the exam immediately after the end of your course, please contact us to find out the best starting date for your course. The exact dates of the exam will be confirmed when registering for the course. Due to the exam date it might be necessary to book the accommodation until Sunday. Price for extra night on request. A minimum of 2 participants is required for this course. The course material for the DELE course is not included in the price and is to be paid on site (prices on request). The Spanish & Cooking course focuses on learning the Spanish language, but you get the chance to take a look in Spanish cuisine. The course includes 20 Spanish lessons and one cooking lessons of about three hours a week. The cooking class takes place at the teacher's home. Together with the teacher you will study recipes of traditional Spanish dishes from southern Spain, especially the traditional and most famous recipes from Cordoba itself. Of course you will, with the help of the teacher, prepare a typical Spanish dish yourself. The Spanish & Cookery course includes 20 lessons Spanis per week and 1 cooking lesson (approx. 3 hours plus time for dinner) per week. The Spanish & Flamenco course combines intensive Spanish classes (20 hours per week) with practical classes in dance or guitar (2 lessons per week). The dance classes are very practical, and during your stay you will not only be able to learn the most important Flamenco dances, but in detail as well. You will work on everything from body posture and arm position to advanced choreography set to the different genres of Flamenco (soleá, seguiriyas, bulerías and so on). You will also learn how to keep complex rhythms and off-beats, which are so crucial to learning Flamenco dance well. If you enjoy Flamenco guitar, this course is ideal for learning all the different styles: solo guitar, song accompaniment on the guitar and dance accompaniment on the guitar. The classes are given to all standards on different levels. The Flamenco guitar and dance courses are given by teachers from the most prestigious Flamenco school in Cordoba, so you know for sure that you will be getting the very best teaching. Flexibility is the main feature of the one-to-one course. As the only student in class you decide the content of the course being up to you. Content can include grammar, conversation, economics, literature or any other subject...it's up to you. The one-to-one course is recommended above all for students with only a short amount of time available or those who wish to consolidate the knowledge obtained from one of our other courses. Living with a Spanish host family in Spain will enable the student to see and understand many aspects of the Spanish lifestyle enabling them to obtain a better knowledge of Spanish culture, traditions, etc. Many host families have been chosen for these purpose in order to make the stay of our students as pleasant as possible. They will be treated as part of the family. Even though Cordoba is quite a big city, the school will always try to accommodate students within a 20/30 minute radius of the school.